The word scar derives from Old French escharre, from Late Latin eschara, which is the latinisation of the Greek ἐσχάρα (eskhara), meaning “hearth, fireplace”, but in medicine it means “scab”, on a wound caused by burning or otherwise. Scars are areas of fibrous tissue (fibrosis) which replace normal tissue after an injury. A scar results from the biological process of wound repair (or injusry repair in general) in the skin and other tissues of the body. Thus, scarring is a natural part of the healing process. With the exception of very minor lesions (see Partial Thickness Wound), every wound (e.g., after accident, disease, or surgery) results in some degree of scarring. An exception to this scar generation are some animals, which regrow tissue without fibrosis formation. Scar tissue is composed of the same protein (collagen) as the tissue that it replaces, but the fiber composition of the protein is different; instead of a random basketweave formation of the collagen fibers found in normal tissue, in fibrosis the collagen cross-links and forms a pronounced alignment in a single direction. Another picture of the skin regeneration process when a wound is inflicted onto the skin. The regenerative process begins from the dermis and works its way up (healing by secondary intention). The the figure below shows part of the skin restructuring before an atrophic, or depressed scar is forming. Scars do not only form on the skin but they also form in other tissues inside the body following an internal injury, trauma, disease, or viral infection. for example a “myocardial infarction”, commonly known as a heart attack, causes scar formation in the heart muscle, which leads to loss of muscular power and hence an increased possibly heart failure. However, in the human body there are some tissues (e.g. bone) that can heal without any structural or functional deterioration. 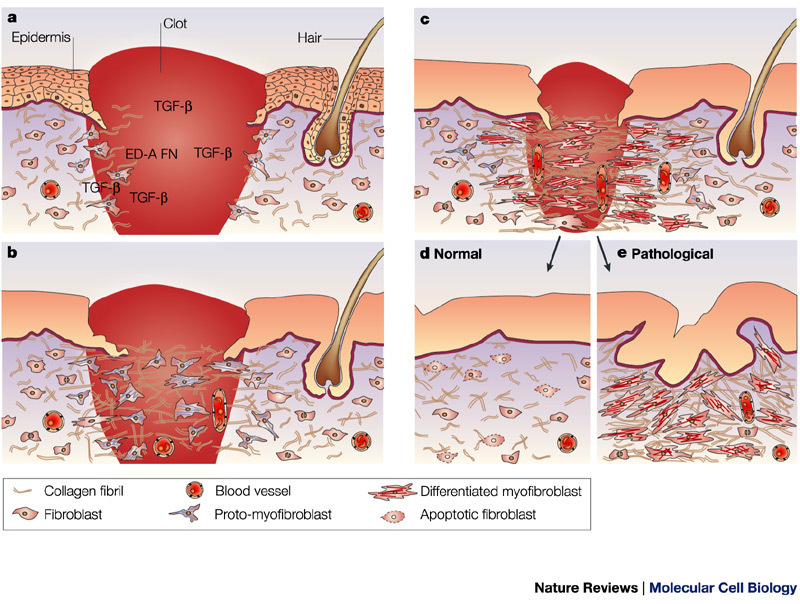 The collagen formation in the scar tissue is usually of inferior functional quality to the normal collagen randomised alignment. For example, scars in the skin are less resistant to ultraviolet radiation, and sweat glands and hair follicles do not grow back within scar tissues. As an example of decreased functionality of fibrotic tissue os the liver dysfunction after prolonged stress which leads to liver scarring and ultimately liver failure if the stress on the Liver is prolonged over time. However, in the human body there are some tissues (e.g. bone) that can heal without any structural or functional deterioration. On the skin, depending on the type of wound inflicted, injury, or healing process the scar which may develop could be either atrophic or hypertrophic.